Gionee’s Marathon series of smartphones are known to pack a larger than usual battery capacity. 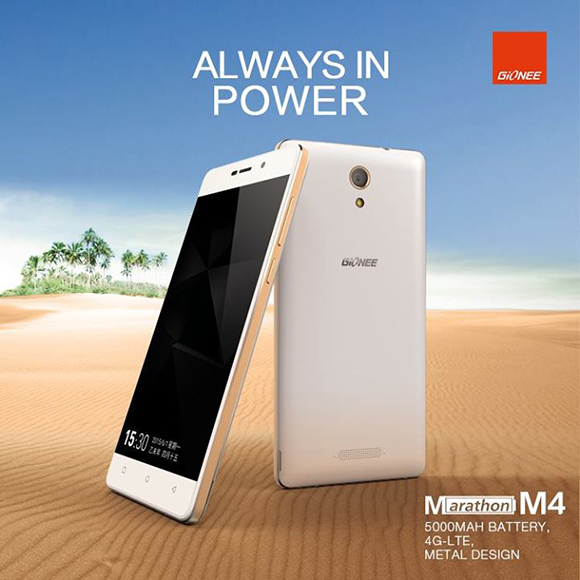 Soon the Chinese company is expected to introduce a new Marathon M4 with an enormous 5,000 mAh battery inside. As Marathon M3’s successor, the new M4 will be wrapped in a metal body and is rumored to feature a 5-inch 720p display. Though there is no confirmation on the hardware, buzz goes around stating that it will pack 1.5GB of RAM. For imaging, there would be 5MP front facing camera and a 8MP camera at the back for capturing high quality images. The 5,000 mAh battery capacity will offer talk time of up to 65 hours and standby time of up to 463 hours. The teaser image of M4 points that it pack 4G LTE network support. In the front are the capacitive menu keys and the design is monoblock, rectangular with rounded edges. We recently heard that the Gionee M5 will come with an even bigger 6000mAh battery.